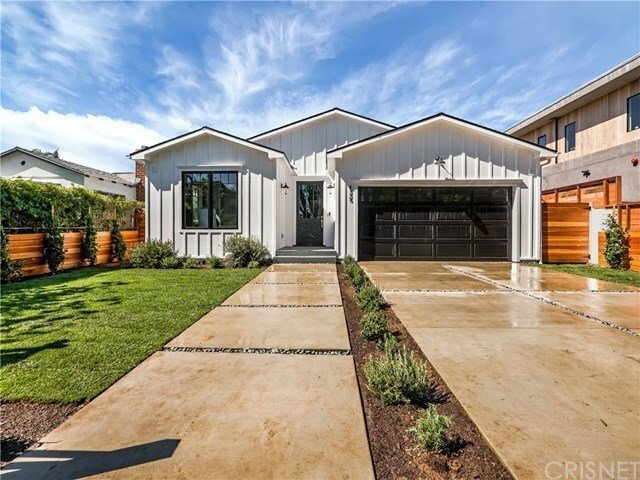 Brand new 2019 one-of-a-kind single-story modern American farmhouse with pool! Built by Riviera Property Group and Joanna Leon, this Del Rey masterpiece brings a rustic touch to Westside living. Sitting on an oversized lot on a beautiful tree-lined street, the home's wood-paneled entryway welcomes you to an airy floor plan featuring 4BD/3.5BA and designer finishes throughout. The expansive chef's kitchen boasts top-of-the-line appliances, custom cabinetry and island, and marble-drenched imported Italian Carrara countertops and backsplash. The great room has impressive 14' vaulted ceilings and custom shiplap detail. The master suite also features vaulted ceilings with a wood-wrapped beam, along with a generous walk-in closet, and contemporary sliders leading out to a redwood deck, sparkling pool and landscaped yard. The chic master bathroom includes a custom marble floor, Kohler fixtures and free-standing tub. Finally, wide plank white-oak flooring throughout the home adds warmth and elegance. This thoughtfully-designed, charming home is situated near premium Westside shopping and dining including Abbot Kinney and the Villa Marina marketplace - not to mention it's moments from the beach!